We all like making beautifully molded aspics, delicate cakes and pastries, and airy creams, but the vast majority of the world has dined on much simpler fare throughout history. For this challenge, give your best interpretation of the food eaten by the nameless rabble. Be sure to document what makes it “working-class”! I made the starter (50/50 rye flour and water) last week. It started to bubble by the third day and is currently very bubbly and happy. There are several articles on bread making in the middle ages. Rye, by all accounts, was among one of the "poorer" grains. This is why I choose it for the flour. Since the average person would have access to honey but not sugar, I used the raw sugar. Olive oil was everywhere - even in countries like England that imported it. As for why I choose bread, it's because of several saints who are said to have - at least for a period of time- eaten nothing but bread with some herbs and drank water. Bread was the very basic stuffs for any dinner and was sometimes the only thing many people - both sinners and saints- got to eat. After waiting a week for that starter, I used half of it for the bread. I combined all the ingredients, kneaded the dough, and waited for the slightest hint that the bread rose. It did very slightly five hours later. So, I kneaded it again and waited....it took a total of 12 hours just waiting for this thing to rise even slightly twice! I then cooked it for 45 minutes at 400F in my modern oven. Time to Complete: FOR.EV.ER. It was a week for the starter and all day for the bread to rise. Total Cost: The rye flour was about $3.50 for the bag. I had everything else on hand. How Successful Was It? : (How did it taste? How did it look? Did it turn out like you thought it would?) I would have liked to let it sit for longer but I had to get the bread done today. However, the bread itself is quite yummy. It's a bit different from whole wheat but quite good. How Accurate Is It? : (fess up to your modifications and make-dos here) I tried to be as accurate as possible with the ingredients. Honey can taste different depending on the regions so that's going to be a bit off. I used sea salt and tap water. The olive oil is probably very close to what my ancestors would have used. The rye flour was organic rye so I'm pretty sure it's close to what would have been used. However, modern oven and modern bread pan. 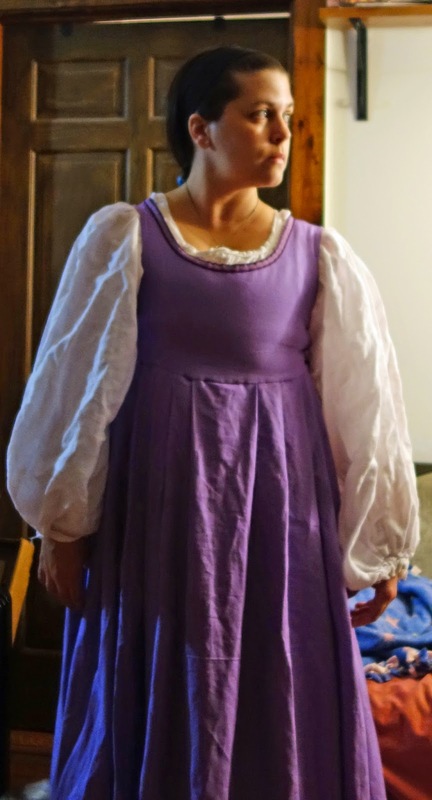 The above is one of my favorite outfits to wear in the SCA and at Renaissance Faires. I normally wear it with the jacket (as above) and a bright orange apron. It's ridiculous in colors but actually pretty accurate for the late 16th century. For lacing, since I wanted to keep the dress as accurate in look as possible, I did something a bit different. I created a regular bodice, using the same pattern as I used for the dress, and punched a bunch of eyelets in it and sewed them up. I then cut out the bodice fabric for the dress but added a couple of inches along the front edge. I folded the edge over, stitched it down, and basically used the fashion fabric as a cover for the bodice. At the front, I just made a few stitches between each of the lacing holes to hold the fabric down and over the bodice. I know this probably doesn't make much sense so here are some photos! Pinching open the space between the fashion fabric and the bodice layer. The lacing goes under the fashion fabric as well. 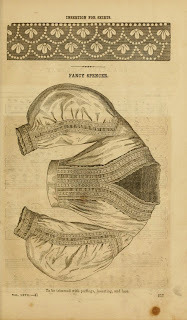 Showing the inside of the bodice. Notice it's spiral lacing. Trying to pinch up the fashion layer so you can see the eyelet underneath. You can also see the stitches that are holding the fashion fabric down to the bodice layer. The trim hides the stitches that actually sew the fashion fabric to the bodice. Hopefully the photos help to make more sense! I bought some linen with an orange and brown print at the thrift store a couple of months ago. It wasn't my color choice but I can't pass up 4 yards of linen for $4.90! 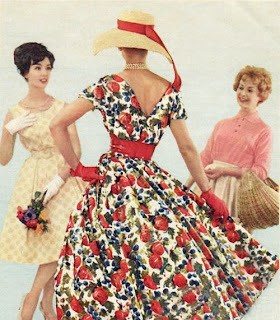 There was just something about it that it wanted to be made into a nice summer dress. I figured something like the above would be perfect but I didn't have any vintage or vintage inspired patterns that even came close to that so....I drafted my own. As you can see, Abby helped. The really wide part of the pattern is the front. This pattern ended up being way more complicated than I originally intended. I had to sew down and iron each of the pleats to make sure they'd stay. Unfortunately, the pleats kept acting up so I'd have to repin, play with the material, repin again, and do this over and over until finally they behaved and I could sew them down and iron them. The skirt is just a half circle skirt. Because I didn't have much in the way of yardage, the stripes are upside down on one half of the skirt. Eh, whatever. I managed to find a vintage brown zipper that was the perfect length in my collection of zippers (they kept selling pack of ten of them at the thrift store for $1 so...I have a lot). Amazingly, the zipper went in without any issues. 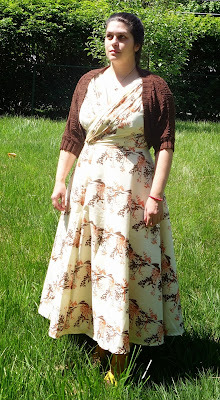 Below is a picture of the finished dress. I'd like to add a belt eventually (and cut the grass later today) but it works for now. Yay! Using the pattern I created here, I cut out my bodice and skirt for a simple, working class early 16th century dress. Fabric: Linen/Rayon blend at Joanns. I loved the color. The lining is 100% linen. The interlining is some purple striped duck cloth I got at Ikea. Directions: First, I cut out all the bodice pieces - one front and one back out of the lining, interlining, and fashion fabric. I then took the rest of the fabric, folded it in half, and ripped it down the middle. (For most simple weaves, you can make a small cut where you'd like to start a straight cut and just tear the fabric in half from there. Makes for some nice, super straight lines.) I realized the fabric is longer than the 45" I'm used to and also ripped off the excess - about 9". The linen strips I have left will probably make some nice hem facing on later historical gowns. The two skirt pieces, I machine sewed the hem and rolled the edges, sewing those down as well. I then sewed the two rectangles together, leaving about a 7" gap at the top. For the bodice, I sewed the shoulders together first. I then put the interlining on the table, followed by the lining facing up, and then the fashion fabric facing down. I pinned at the corners and seams, machine sewing from the waistline, around the armsyce, and back down the back. I then turned it and hand sewed the neckline. I pleated the skirt to the bodice. 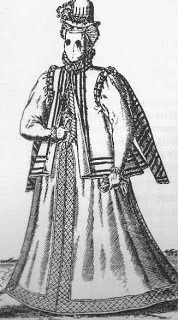 The front has double pleats at the sides and the back had double pleats at the back. This was to get most of the fabric towards the back and sides, away from the front of the skirt. Once those were pleated, I machine sewed the skirt to the bodice and hand sewed the lining closed. I then punched seven eyelets on each side, sewing those. I also hand sewed down the neck trim which you can't see clearly in these photos. Sorry! It's a nice wool trim in purple and blue. Things you'd do differently: The neckline should be lower - that I can easily fix. 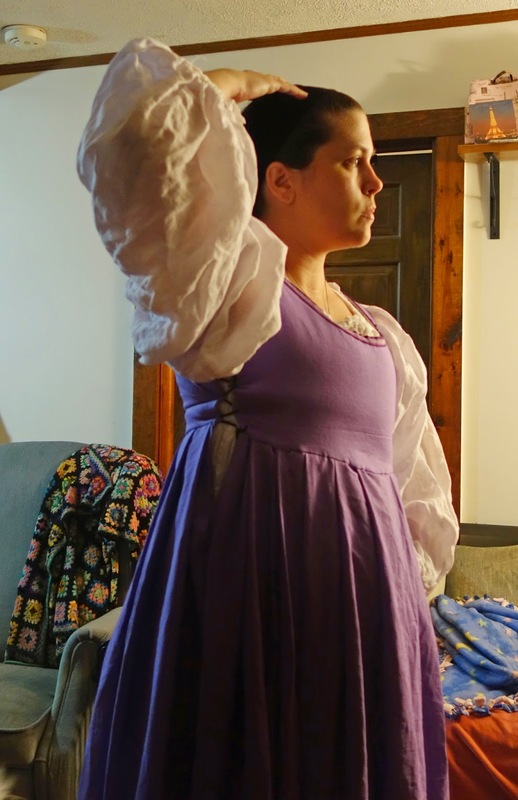 Also, I need to make the bodice a bit more fitted at the underbust - another easy fix. However, as the photos show, it fits and it's honestly pretty comfortable. I think I'll be quite happy with it at Pennsic. It's that time of year, again. Where my brain goes to all Pennsic, all the time. There is only a month left to pre-register for a space at a camp online. The mail in date is only a week away. If you don't pre-register, you will, most likely, be in singles camping. The further you get to the center of things, the more likely that land is precious - every person is allocated 250sq when they pre-register. If you don't pre-register, your encampment looses that 250sq and that means they have to make room for you if they can and are overly nice. I don't have to worry about tent poles and leaky tents anymore. I get to stay inside my nice comfortable tiny house when it rains and not worry about things like flooding as well. Wind really isn't an issue anymore either. Yeah, I know. But for the first er...seven Pennsics? I went to, I did have to worry about those things. I used pallets to raise the tent floor off the ground. Throw a couple of boards down and some rugs on top of that? You have a fabulous comfortable floor that is just high enough that water isn't an issue. If your tent falling down has been an issue (it wasn't with an easy up and the cover I made for it), check your ropes daily. Tighten them as much as you can. The rain and sun can cause the ropes to lengthen a bit. You might recognize the battlefield if you've ever been to Pennsic before. Everyone who is a land agent camps out on the field Friday night. For me, it's easy. I just go and sleep in the trailer. Some people put up "earth pimples", some sleep in their cars on top of their stuff, others stay up all night. If you actually have the other land agents on your land show up Friday night, you can do a quick registration, get everyone to agree on who goes where, and then drive to your space that night - but some people can't get there on Friday with very good reasons. Being a land agent and registering your space can be easy or difficult depending on the other land agents, If you aren't down in the Serengeti or the Bog, you'll probably have an easier time than if you are. Because land is at a premium in those locations, some people might get a bit upset if their "traditional" lines are messed with. What it all comes down to though is who has the most people pre-registered. This is why pre-registration is so important. If you have 25 people pre-registered, then you get to mark off 6250sq of space. If the other land agent has only 7 but thinks as many as 12 people are coming, well, guess what happens? The group that has the most pre-registered gets the most land. If there suddenly isn't enough space for those extra people, there is little you can do. Each land agent is given a map of their slotted land. You draw boundary lines on the map for each group that will be camping in that location. The finished map with all the lines and group names gets handed in as land registration. You are then given a plastic baggy and a piece of paper that shows your group is registered to be on that land. This piece of paper is vital. You need to have it displayed in a conspicuous manner. Most people have it attached to their gates some how. Once all that is done, you get to set up camp! Some camps are WAY more elaborate than others. No matter what, if you are the land agent, you'll probably be in charge of setting up the basics yourself or with whomever you managed to bring with you. Basics as in a shower tent, a kitchen tent, a fire pit, ect. Not everyone will have a kitchen tent - there are plenty of places to eat at Pennsic- but most will have a shower tent and a fire pit. Whatever the basics are for your camp, you'll probably have to at least lay the foundation for them. Once that's done, take a walk around Pennsic. See if anyone else needs help. If you are too tired, just sit back and relax for a couple of days until some of the rest of your camp comes in. A lot of people come in either the Friday or Saturday of Peace week (the first full week of Pennsic). Although a land agent must be "in charge" of their encampment 24/7 at Pennsic that doesn't mean you can't leave the grounds. You are free to go grocery shopping, to the laundry, or just to Walmart. Home Depot is also good depending on what you might have forgotten. I also go to Church down the road on Sundays...followed by going to Aldi's because they have those cookies I love. As long as you can get back to the site in a reasonable amount of time should an emergency occur, you're fine. Clean up once everyone heads home is also your responsibility. The doesn't mean that your campmates get to trash the place and leave you to clean up - everyone should be helping - but if the Coopers have anything to say about the state you left the place in, they'll contact you. Let me know if you have any questions about Pennsic or if you are planning on going! I'd love to see some of you there! 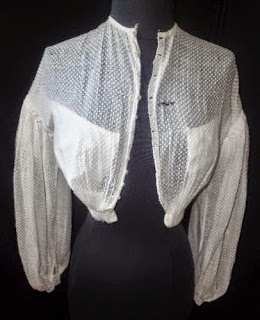 Garibaldi Blouse: What it is and what it isn't. I thought I wrote this up last year when I was investigating "Swiss Waists" and what they were really called, but I didn't. Whoops! I guess it's never too late! When I first started looking in the 1860's, I kept coming across the term Garibaldi as a blouse women in the 1860's wore. While I've discovered this is true, there appears to be some confusion on the very specific type of garment the Garibaldi is. Which might mean it was the "American" term versus the "British" term (think what "pants" means in American versus British today). I'm honestly not sure. However, based on the various fashion mags of the day, the fitted blouse was called either a waist or a spencer. The above are all called "Garibaldi" and yes, they are all quite baggy. They were named after a famous Italian General who, among his many military victories and being a fore-father of modern Italy, was known for the baggy red shirts his volunteers would wear in lieu of a uniform. The term shows up in several magazines of the era as a baggy blouse although it can be referred to as a waist or a shirt. The Garibaldi is meant to look very masculine. Although it's great if you plan on working in the camp kitchen all day at a Civil War re-enactment, it's not exactly the most flattering garment. The Garibaldi came in a wide variety of colors. Although red and white were the most popular, blues, greens, and pinks are also mentioned in Peterson's and Godey's. They could be silk, cotton, wool, or really any lightweight material of the day. So, if you are like me and want a fitted blouse, it's a waist or spencer. If you want a good work shirt, then it's a Garibaldi. It can be orange-flavored, orange-colored, or just plain oranges - but the challenge is “orange”! The Recipe: (where did you find it, link to it if possible) To Make Apple Pufs To make Apple pufs. TAke a Pomewater or any other Apple that is not hard, or harsh in taste: mince it small with a dozen or twenty Razins of the Sunne: wet the Apples in two Egges, beat them all together with the backe of a Knife, or a Spoone. Season them with Nutmeg, Rosewater, Sugar, and Ginger: drop them into a Frying-pan with a Spoone, frye them like Egges, wring on the iuyce of an Orenge, or Lemmon, and serue them in. How Did You Make It: (a brief synopsis of the process of creation) I still have some frozen apples so I took those out and heated them slightly in water to re-hyrdate them (they've been in the freezer over six months. Any water they had in them has been freeze dried out of them pretty much at this point). I also had raisins, eggs, sugar, rosewater, nutmeg, and ginger. I bought an orange and juiced. Although, honestly, our oranges are way sweeter than theirs would have been. I used about 4 cut and peeled apples, three handfuls of raisins, two eggs, 40 twists of the nutmeg grinder, about a teaspoon and a half of ginger, 1 tablespoon of sugar, and 1 tablespoon of rosewater. I admit, I used the oh so historical blender rather than a spoon to mix everything together. However, this ended up being VERY watery so I put it into a sieve and that reduced the volume by about half. However, it also made it easier to scoop up and cook like eggs. Not that I'm great at that either - there is a reason I always end up with scrabbled eggs. Then, once the now scrambled apple puffs (which is the reason there aren't any pictures. It looked like burnt cat food) were done, I poured a bit of the orange juice over them. Time to Complete: Maybe a half hour? Total Cost: The oranges were $2.99 a pound (organic). Everything else I already had. How Successful Was It? : (How did it taste? How did it look? Did it turn out like you thought it would?) Honestly, it was pretty good. I mean, it's apples, oranges, and raisins with extra sugar - it's not like it could taste that bad. I need to work on the amounts of spices and water but it is something I'll try again so...not bad. I think it would be a good early modern vegan "meat (less) ball" for pastas. This with the white sauce (it had oranges in it too) I was looking at over pasta? Might not be a bad choice next year for Lent. How Accurate Is It? : (fess up to your modifications and make-dos here) So, I only used two eggs because out eggs now are much bigger than what they would have had in the early 17th century. The oranges are also sweeter. The apples are of a late 18th century variety - that being said, they would have recognized everything I used easily. Except the blender. I even used olive oil to fry the puffs in so yeah, the blender. And the stove. Step One: You'll need about a yard of fabric, folded in half. You can use the 36" wide muslin or any cheap fabric. I'm using a piece of an old bedsheet that I'm so glad I get to destroy. I really didn't like them. Step Two: In the middle of the folded fabric, make a cut a couple of inches deep. This is partly to mark the middle of the folded fabric and also to help cut out the next step. Step Three: Draw a half circle around the cut. It does not need to be perfect. All it needs to be is deeper in the front than in the back of the still folded piece of fabric. The above is to show the circular piece cut out. What you can do is cut it out for the back and then cut it deeper for the front. Just fold the cut out piece at the half way mark to make both even if you like. Step Four: Put the fabric with the cut out neckhole on the dress dummy. Step Five: Pin the fabric tight at the sides. For this project, we are going to use the K.I.S.S. principle and make it a side lacing bodice. This is to show the back of the pinned-at-the-sides fabric. Step six: You'll want to pinch the fabric at the arms to figure out where to cut. You'll want to leave about 1" or more fabric along the edges for now so you have some play room. Step seven: Cut the fabric away. You should have something similar to the above. Step eight: Don't forget to pin the shoulder area and cut that excess away. You might have to pull up a bit on the fabric to get a decent about of fabric pinched up at the shoulder. Step nine: Continue to pull the fabric tight. You might find that pinning the fabric to the dress dummy directly down the back and front helps slightly. It's okay if you end up with darts in odd places - just pin them so they are flat as I've done in the above photo. We'll draft out the darts when you cut this out to make the final pattern. Step ten: You might find it easier to draw out the lines for the armsyce before you cut it. Step eleven: Once the armsyce is cut and you are pretty happy with how tight the bodice is, cut away the rest of the excess fabric. Since this is an Italian bodice, you'll want to cut away the excess below the bust as well as around the side lace opening. Step Twelve: One you have it to the length you want, it's time to cut out your desired neckline. I've drawn in what I'd like the neckline to be. Don't forget about seams! 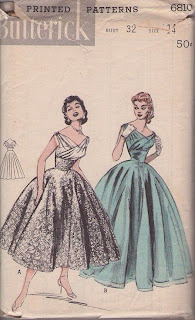 You want about 1/4" higher than your actual desired neckline. Step thirteen: Double check everything. I had to tighten the bottom part of the bodice in the picture above. Once you've double checked everything, all you need is half the front and half the back to make a pattern. Step fourteen: Copy the draped pieces to either fabric or paper to make a pattern. The back should be easy but if you have any darts, like I do on the front, draft those out. For more information on how to do that, please refer to how to take a commercial pattern and make it into a reasonably period pattern. There are pictures of drafting - or pinching- out the dart of a commercial pattern. The steps are the same as you would do here. In the picture above, I'm comparing the side widths of both the front and back. You'll want to compare with the shoulders as well - make sure they are the same and cut off any excess. Yay! Final pattern! I've been using a pattern I made using this technique for well over 8 years now. It works beautifully. Over the next week, I'll make a new Italian gown using this new pattern to show the fit and drape - as well as how to use this pattern to make a gown.